Tired of fighting with your high chair? Need something thats easy to move around, easy to store, and easy to clean? The Cosco Simple Fold High Chair has been specially designed with busy parents in mind. The high chair boasts an easy-wipe seat, so cleaning up takes seconds. The seat also folds up flat and stands on its own making it easy to store away. The chair has a full-sized seat back and is comfortable for your little one to sit in. 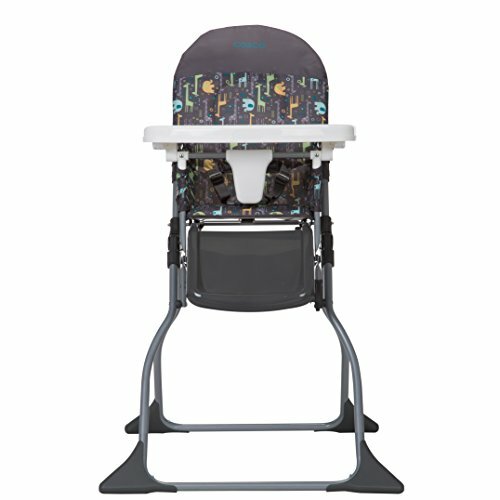 The Cosco Simple Fold High Chair also features a fully adjustable tray with a built-in cup holder. This 3-position tray grows with your child, giving them extra room as they need it. Each Simple Fold High Chair has been specially engineered to be lightweight and compact so that you can take it with you on the go. The chair folds down into an easy-to-manage package that you can fit in the car or store away. With an easy setup and a quick fold, youll spend less time worrying about the high chair and more time having fun with your little one. TAKE IT ON THE GO - Need a high chair on the go? The Cosco Simple Fold High Chair has been designed to be compact and lightweight to fit into your trunk when you're on the move. FOLDS FLAT FOR STORAGE - Save on space with this Cosco High Chair. Each chair folds flat and stands up on its own so that you can easily store it away. SETUP TAKES JUST SECONDS - The simple design of the high chair lets you set it up in seconds. After mealtime, folding it down is simple too. SAVE TIME ON CLEANING - The Cosco Simple Fold High Chair has an easy-wipe seat, so cleaning up only takes a few seconds. Simply wipe down the seat with a damp cloth and you're done. FULL-FEATURED DESIGN - Don't let the simple design fool you. The Cosco Simple Fold High Chair is full-sized and includes an adjustable tray with a built-in cup holder.